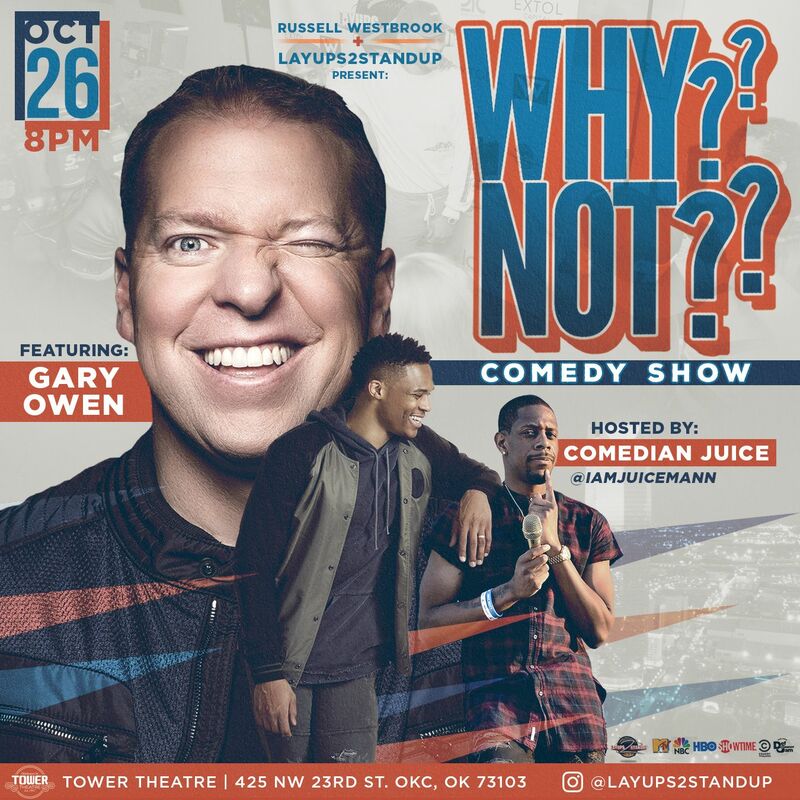 Layups2Standup and NBA MVP Russell Westbrook bring an evening of infamous comedy to Oklahoma with the 3rd Annual "Why Not??" Comedy Show headlined by celebrity comedian Gary Owen. OKLAHOMA CITY - Oct. 22, 2018 - PRLog -- Layups2Standup, an innovative brand that channels the love of basketball and comedy to create community events, is gearing up for the much anticipated 3rd Annual "Why Not??" Comedy Show hosted by Oklahoma Thunder's very own Russell Westbrook and Layups2Standup CEO Comedian "Juice" Deason. The event is set to take place Friday, October 26th at the iconic Tower Theatre in Oklahoma City. The inaugural "Why Not?? Comedy Show" was created to become a staple event in Oklahoma, kicking off the Thunder's NBA season, with a primary focus to support local non-profits. "Each year we select a charitable cause to support in our effort to give back to the community. This year we decided to partner with Regional Food Bank of Oklahoma's- Kid Backpack Program. Growing up in the inner-city as a child, I remember many times when we didn't have much to eat, so this initiative really hit home," said, Demetrius Deason (Comedian and CEO of Layups2Standup). Last week Layups2Standup partnered with Dave & Busters to create a unique event for twenty-five kids participating in the "Kid's Backpack Program". The kids were treated to dinner, unlimited gaming, gift bags, and left with words of encouragement from Deason and Westbrook to never give up on their dreams. Now in its third year, the "Why Not?? Comedy Show" is slated to be bigger and better, cultivating an evening of laughter and premiere entertainment. Headlining the show is celebrity comedian Gary Owen. Owen has entertained audiences for over a decade with his side-splitting comedy, selling out audiences in major comedy clubs and theatres across the country. Last year, he starred opposite of Mike Epps and Mike Tyson in the comedy "MEET THE BLACKS". Other features include popular Screen Gems' franchise "THINK LIKE A MAN" (2012), as well as the successful follow up "THINK LIKE A MAN TOO" (2014). Owen's most recent work is his comedy special, "I Got My Associates", currently airing on Showtime. B.T. Kingsley noted for a 30 min special on Comedy Central "Hart of the City", produced by superstar comedian, Kevin Hart and "We got next" produced by NBA Legend, Magic Johnson. Ron Taylor, a rising comedian who has made his way to National tv shows such as B.E.T's "Live at the Apollo" and multiple appearances on Fox T.V. 's "Laughs". Ron is currently a regular host at Hollywood Comedy Store- "Crack Em Up Comedy". Yasmin Bayatfar, an enigmatic 24-year-old Persian American Comedian who is most notable for opening up for Jordan Rock and performing on Comedy Central's Roast Battle. With a star-studded red carpet lined with celebrities, professional athletes, corporate partners and the "who's who" of Oklahoma, why would you miss the 3rd Annual "Why Not?? Comedy Show"!? Event partners include: 21c Museum Hotel, Prairie Wolf Distillery, Wharton Events & Management, and Nina Zavala Group.